Bottom left: Methuselah's beard, in front, compared to common witch's hair behind. Methuselah's beard has a central white cord that is visible when it is pulled apart, and common witch's hair doesn't. Photo by Cody Gold. Other photos by Brian Starzomski (top), and Ian Cruickshank (bottom right). Methuselah's beard is a large, easily recognizable species. It is a 'hanging hair' lichen, meaning its network of thin, hair-like branches drapes over and hangs from branches. It has a thicker, unbranched main strand that has a whitish central cord resembling an elastic band. The outer cortex can get eroded, which subsequently exposes this white central cord. The main strand gets at least 15-35 cm long, and some coastal specimens grow to over 6 m long. Shorter, thinner branchlets attach to the main strand. This lichen is a pale yellow-green colour, and does not bear soredia (tiny powdery clumps of fungal and algal cells). Methuselah's beard drapes and hangs from various tree and shrub species in open, well-ventilated coniferous and hardwood forests, as well as riparian areas. It is mostly found in old-growth forests, and though it is not a particularly common species it can be locally abundant. It grows particularly well in coastal climates and on humid, foggy mountains. Its west coast range stretches from Alaska to northern California, and generally does not extend east of the Coast-Cascade Mountains. Its historic range was almost circumboreal — it was found across North America, Europe, Scandinavia, Asia, and northern Africa — but this range is now greatly reduced (see Intriguing Info below). 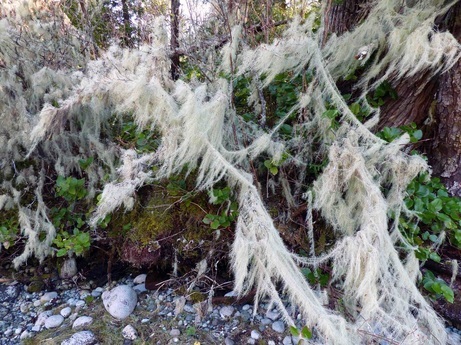 Common witch's hair (Alectoria sarmentosa) is a similar-looking 'hanging hair' lichen, but it lacks the white central cord of Methuselah's beard. 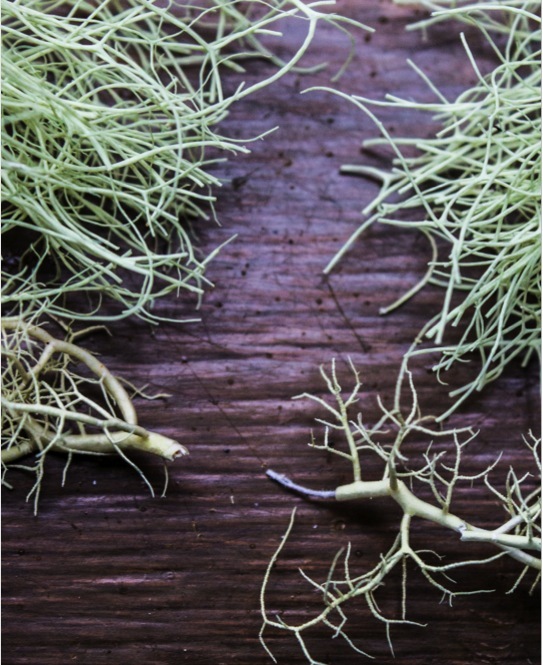 This thicker central cord is often visible when the lichen hanging, and its presence can be verified close up, as in the top left photo. The tinsel-like look of Methuselah's beard as it hangs from old-growth conifers is not a coincidence: it was the original Christmas tree tinsel (see the Hakai Wild video below). 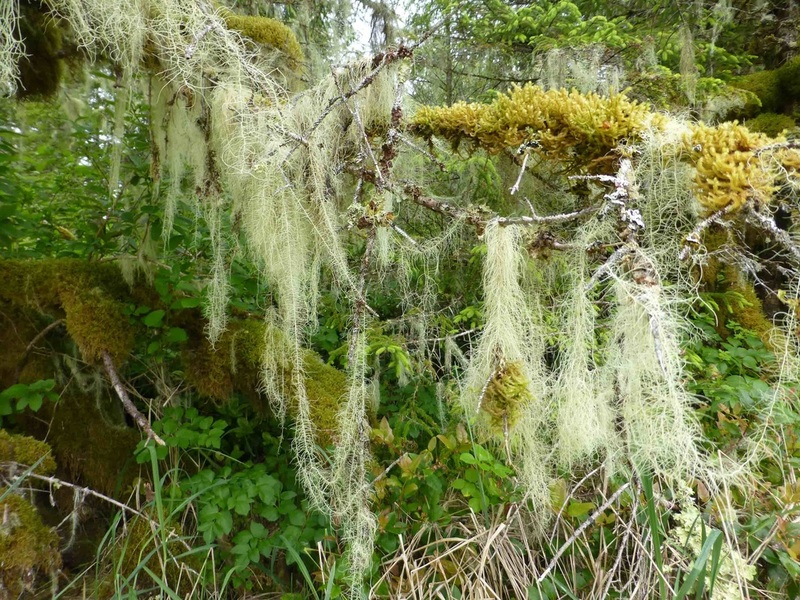 Methuselah's beard grows best in old-growth forests, and doesn't appear to last long in second-growth forests. This means it usually disappears in areas where old growth is logged. Some research indicates it is strongly limited by its main (or only) dispersal mechanism - it disperses through fragments carried to new locations, and usually these fragments are large and only disperse short distances. As a result it is slow disperse and to become established. The historic range of Methuselah's beard has been reduced, and it is now endangered or extirpated in most of Europe and Scandinavia, and rare in California. This is the result of habitat degradation and fragmentation, in part due to the loss of the old growth forests in which it grows best. This decrease in range is also the result of air pollution - this species is very sensitive to air quality issues, and grows best in well-ventilated areas. Pojar, J. and MacKinnon, A. (1994). Plants of Coastal British Columbia. Vancouver, BC: Lone Pine Publishing. P. 503. Ponzetti, J. and Wittmann, E. (2006). 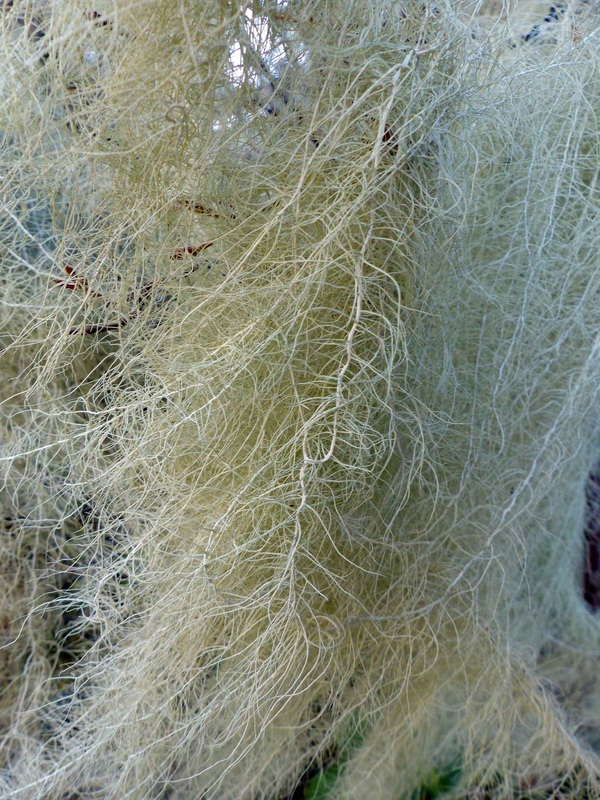 Fact sheet for Usnea longissima. USDA Forest Service.